On November 18, 2013, the Georgia Commission on Mediation reminded mediators and attorneys that “Mediation Confidentiality is Forever.” In Advisory Opinion 8, the Commission clarified that neither mediators nor attorneys may talk about mediation discussions, results, or processes that could identify a specific case without an agreement in advance between the parties about what can be discussed. The Commission emphasized that, if the parties anticipate talking with the press or public about issues that were discussed in mediation, they should decide who may talk and what will be said. They should then write that decision into their mediation agreement. One aside by the Commission could have interesting implications for mediators who are registered with the GODR and mediate cases that are not referred by the court-connected ADR program: “the Commission on Dispute Resolution claims jurisdiction over ADR cases arising out of approved ADR court programs and over the conduct of registered mediators in any ADR setting.” This is a clear indication that the Commission claims jurisdiction over registered mediators conducting non court-referred mediations. Printed in the The Atlanta Bar Association newsletter for the Dispute Resolution Section. Please stop by the GSU College of Law’s Investor Advocacy Clinic blog and read this post, written by law student Thomas Abrahamson. For years, a recurring topic of debate amongst federal courts of all levels has been the issue of whether an arbitration agreement that waives an employee’s statutory right to bring a collective action under the Fair Labor Standards Act (“FLSA”) is enforceable under the Federal Arbitration Act (“FAA”). On January 6 of this year, we posted a review of 2013 cases that included a laudatory reference to the District Court’s (Judge Totenberg) opinion in Walthour v. Chipio Windshield Repair, LLC,  in which the court demonstrated how the right to collective action under the FLSA was intended by Congress to be a substantive, non-waivable right. However (as we noted then), after making its point, the court “yielded to the reality of overwhelming contrary precedent and upheld the collective action waiver.” Late last month, the 11th Circuit affirmed that decision, holding for the first time that a waiver of the right to collective action under the FLSA is, indeed, enforceable. Although this decision is certainly a victory for arbitration, we can’t help but pay homage to the victory’s bittersweet tinge, as a little part of employees’ rights somewhere utters its death rattle. Brooklyn Sav. Bank v. O’Neil, 324 U.S. 697, 707 n.18 (1945). See, e.g., Brooklyn Sav. Bank v. O’Neil, 324 U.S. 697, 707 (1945). Caley v. Gulfstream Aerospace Corp., 428 F.3d 1359, 1367 (11th Cir. 2005). Moses H. Cone Mem’l Hosp. v. Mercury Constr. Corp., 460 U.S. 1, 24-25 (1983). Walthour et al v. Chipio Windshield Repair, LLC et al, 1:12-CV-1491-AT (Feb. 27, 2013). Gilmer v. Interstate/Johnson Lane Corp., 500 U.S. 20, 33, 111 S. Ct. 1647, 1652 (1991). People of various faiths have been using extrajudicial forms of religious-based dispute resolution for centuries in the United States, including here in our home state of Georgia. Such tribunals include the Orthodox Jewish Beth Din tribunal and the ecclesiastical courts of the Catholic Church. Most commonly, these faith-based tribunals resolve matters of family law, such as divorce and property settlement disputes; however, some also engage in commercial arbitration and mediation. Historically, Georgia courts have enforced these tribunals’ judgments either under prevailing arbitration laws or principles of comity, provided the awards and procedures are consistent with public policy. Georgia courts have also historically enforced foreign arbitral tribunal rulings in accordance with the same principles. But a bill introduced this year in the Georgia General Assembly would have called all of these time-tested practices into question. The 2013-2014 Regular Session saw the introduction – and defeat – of House Bill 895 (“HB895”). 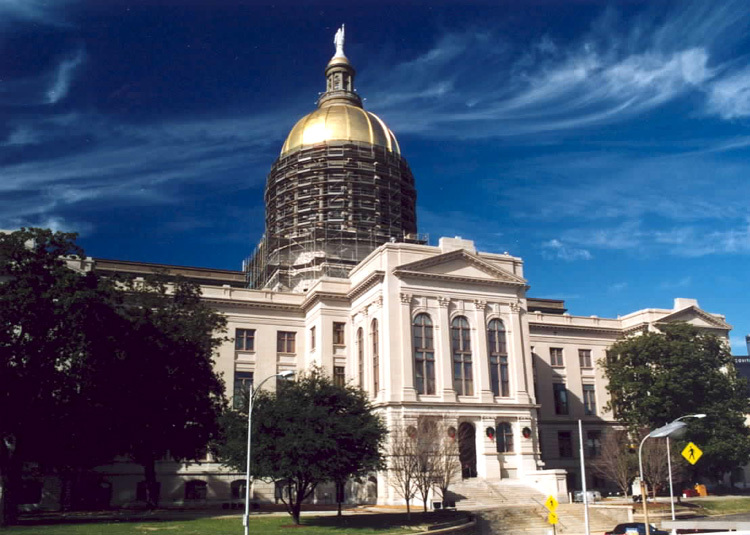 HB895, officially titled “Laws and statutes; effect and enforcement of foreign laws; revise provisions,” was a thinly-veiled attempt at implementing anti-Sharia legislation in order to address a problem perceived by some political conservatives, namely that Sharia law is “creeping” into U.S. and Georgia courts. So what’s the problem with trying to keep Sharia law out of Georgia law, anyway? The problem, simply put, is that Sharia law isn’t creeping in to Georgia law at all. To the contrary, our review of the CSP report revealed that most of the cases in the report have absolutely nothing to do with Sharia law at all. Those few cases that do discuss Sharia law, discuss it in the context of ruling it out as a possible application of the law for the foreign litigants in that court. No case cited is from Georgia. Aside from the practical problems implicated by a total lack of evidence, the Bill also presents more complex, long-term problems for Georgia courts and Georgia commerce. To begin with, the effect of HB895 on courts would have been to restrict them in terms of applying public policy. The bill could also bar enforcement of rulings by the previously-mentioned religious tribunals. It ain’t broke, and to fix it would have unintended consequences. For example, it could adversely affect Georgia courts’ ability to enforce a divorce decree issued by, say, a court of the United Kingdom because UK legal procedure does not match that of Georgia. This could disrupt long-standing practices upon which many Georgians rely – or at least have taken for granted until now. Ultimately, such legal xenophobia would become a permanent deterrent for foreign businesses to choose Georgia as a forum for arbitration and other forms of dispute resolution, effectively undoing the Atlanta legal and ADR communities’ efforts to make the city an international hub for ADR. Thankfully, HB895 was thrown out as of “Crossover Day,” Monday, March 3. A similar bill was introduced in the 2012 session, so it remains to be seen whether it will reappear in the next session. See, e.g., The Roman Catholic Archdiocese of Atlanta, “Introduction to the Court and its Cases,” available at http://www.archatl.com/offices/tribunal/intro.html; Catholic Diocese of Arlington, “Outreach: The office For Canonical affairs and the Tribunal,” available at http://www.arlingtondiocese.org/tribunal/index.aspx. See Beth Din of America, “Arbitration and Mediation,” available at http://www.bethdin.org/arbitration-mediation.asp. See O.C.G.A. § 1-3-9 (generally recognizing the validity of other courts’ decisions, in the same vein as the deeply-embedded American legal concepts of reciprocity and full faith and credit). See O.C.G.A. § 9-10-31.1 (allowing a court to determine that a particular action “would be more properly heard in a forum outside this state” or elsewhere within this state). See Awad v. Ziriax, 670 F.3d 1111 (10th Cir. 2012) (holding Oklahoma Referendum 755, an explicit anti-Sharia law, was unconstitutional as a violation of the Establishment Clause of the First Amendment). Center for Security Policy, “Sharia Law and American State Courts: An Assessment of State Appellate Court Cases,” Version I.3 (May 20, 2011). Unfortunately the negotiation table can turn into a poker table in which those bearing “esquire” after their name try their hardest to act as both player and pit boss. No one expects the full truth, but when does a half-truth become a full lie? What is acceptable in the game of negotiation? Am I liable for everything I say? In the course of representing a client a lawyer shall not knowingly make a false statement of material fact or law to a third person or fail to disclose a material fact to a third person when disclosure is necessary to avoid assisting a criminal or fraudulent act by a client, unless disclosure is prohibited under [the rule of confidentiality]. Under generally accepted conventions in negotiation, certain types of statements ordinarily are not taken as statements of material fact. Comments which fall under the general category of ‘puffing’ do not violate this rule. Estimates of price or value placed on the subject of a transaction and a party’s intentions as to an acceptable settlement of a claim are in this category, and so is the existence of an undisclosed principal except where nondisclosure of a principal would constitute fraud. Currently, California is trying to decipher what Georgia already has already attempted to do. In a proposed California ethics opinion it appears that California wants to make clear that “permissible puffery” is perfectly acceptable. In fact, the opinion states that it is expected during negotiations; however, Californians beware, “improper false statements of material fact” during these same negotiations may leave California lawyers negotiating the status of their legal license with the California State Bar. So what’s the difference between puffery and improper false statements of material fact in the eyes of our West Coast Counterparts? The California Standing Committee on Professional Responsibility and Conduct states that it expects lawyers to keep opposing parties “at arm’s length” during negotiations. Ironically, the opinion states that an attorney revealing a client’s actual “bottom-line” could be a violation of the attorney/client privilege. This is to say that the ethics committee expects some dishonesty between opposing parties when sitting at the negotiation table. To say one’s bottom line is $10,000 when it is really $2,500 seems to be acceptable, but revealing that bottom line explicitly may not be acceptable. Where things begin to get tricky is when an attorney says, “That will cause my client to go into bankruptcy.” This statement may materially alter the terms of the negotiation. However, if this statement is made in good faith and there is a good faith basis that your client might actually file for bankruptcy and be accepted as a candidate for bankruptcy, then claiming this potential fact is perfectly acceptable. What we do know, for certain, is that California lawyers will find themselves facing sanctions when they make false statements of material facts or actively conceal or suppress material facts. Any statement made with the intention of having a party rely on false, material, and verifiable facts or information is impermissible. Attorneys are not permitted, under any circumstance, to lie or conceal evidence, especially when it will materially alter the terms of the negotiation. So, in sum, lawyers are allowed to play hard ball… but not allowed to cheat in hopes of getting the home run. Earlier this month, Austrian skier Daniela Bauer brought the first application for this winter Olympics to the CAS. The Austrian skier felt she was discriminated against when she was unjustly left off the Austrian Olympic ski team. Bauer argued that she was left off the team despite having “met the FIS qualification requirements.” About 24 hours after hearing Bauer’s complaint, the CAS panel of three dismissed the case stating that Bauer was not discriminated against and the ASF acted reasonably as they excluded Bauer from the Austrian ski team based on her level of performance. However, the panel did highlight the fact that unofficial sources connected with ASF may have created unreasonable expectations that Bauer would have been selected had she met certain criteria. The CAS recommended the ASF publish official criteria that will allow athletes to clearly understand the qualification methods for the Olympic Games and avoid further confusion. One day after the Bauer decision, CAS registered a new application from Argentinean freestyle skier, Clyde Getty. Getty filed a complaint against the International Skiing Federation (FIS). The 52-year-old skier’s complaint was soon dismissed. Citing the Freestyle Skiing Qualification System (FSQS), the CAS ruled that there was no interpretation of the qualifications that would make Getty eligible as Getty had not even met the minimum amount of qualification points required by FSQS. With ten day left in Russia the athletes are clearly faring better on the slopes then they are in front of the CAS. What can a court do when driven too far? As I and many others predicted when the 11th Circuit adopted manifest disregard of the law in Montes and when the state legislature added manifest disregard of the law to the enumerated grounds for vacatur in the Georgia Arbitration Code, it served merely as an open invitation for every loser to challenge awards and that courts would lose their patience with it. Until the 11th Circuit abolished manifest disregard in the wake of the Hall Street decision, it consistently discouraged petitions for vacatur on this ground and warned of sanctions in future appeals. See B.L. Harbert Intern., LLC v. Hercules Steel Co., 441 F.3d 905, 914 (11th Cir. 2006) (the Court “is exasperated by those who attempt to salvage arbitration losses through litigation that has no sound basis in the law applicable to arbitration awards.”). Although the 11th Circuit refrained from imposing sanctions in Harbert, its intention to do so in the future inspired the imposition of sanctions in Cohen v. A.G. Edwards & Sons, Inc., Case 2005-CV-100-613, Fulton County Superior Court order dated July 20, 2006 (using the 11th Circuit’s rationale in Harbert to award attorney’s fees against movant who had no substantial justification to argue manifest disregard of law). In 2013, Fulton County drove the court too far in Fulton County v. Lord, 746 S.E.2d 188 (Ga. App. 2013) (award of attorney fees justified when County asserted manifest disregard of the law but only showed that the arbitrator merely disagreed with the County’s position). What can an arbitrator do when driven too far? I’ve always asserted that arbitrators lack overt power to sanction parties for abuse of the arbitral process. Instead, they can use their power to award costs and attorneys’ fees (when expressly empowered). As for the parties’ claims, arbitrators need to decide on the evidence presented. Perhaps I was wrong. In Murtagh v. Emory Univ., 741 S.E.2d 212 (Ga. Ct. App. 2013), reconsideration denied (Ga. Ct. App. Apr. 11, 2013), the court determined that the arbitrator did not exceed his authority by dismissing claims as a response to the malfeasance of a party to the arbitration. The court cited a federal case out of Florida, First Preservation Capital v. Smith Barney, Harris Upham & Co., 939 F.Supp. 1559 (S.D.Fla.1996) (arbitration panel did not exceed its authority when it dismissed claims with prejudice after claimant interfered with arbitration procedures). In October, the AAA revised its rules to specifically authorize the arbitrator to impose “appropriate sanctions” upon request by a party in the situation where the other party has failed to comply with the rules or an order of the arbitrator. The arbitrator is required to explain in writing any such order and further is required to permit submission of evidence and argument before making an award. The party facing a potential sanction has the opportunity to respond. Rule 58. This is a game-changing power, in my opinion. Hats off to the Georgia Court of Appeals on both cases. Guess what I do during the Christmas break—I update the treatise, ADR: Practice and Procedure in Georgia (West, new 4th edition, forthcoming May 2014– BUY TODAY!). In this year’s end-of-the-year frenzy, I am once again struck by some of the amazing judicial decisions that come down from on high. This is the first of several blog entries that comment on 2013’s arbitration cases. Let’s start with class arbitrations and Scalia’s ham-fisted continuing efforts to crush class actions through the Federal Arbitration Act. After reading his majority decision in American Express v. Italian Colors, I was left scratching my head. So, despite making it economically irrational to prove antitrust and thus essentially impossible to vindicate one’s statutory rights under the Sherman and Clayton Acts, class arbitration waivers are enforceable? No problem—one still has the right to vindicate the statutory remedy even if now no one will. Score again for the American Chamber of Commerce–Concepcion and then this. Not so classy. The absurdity of Scalia’s logic is brilliantly dissected in Kagan’s cogent dissent (worth the read). Perhaps it was a tradeoff. Kagan got to write for the majority in Oxford Health Plans v. Sutter upholding the arbitrator’s decision to proceed with class arbitration when the arbitral clause was silent on the matter. Working off what appeared to be a tiny window of opportunity in Alito’s majority decision in Stolt-Nielsen v. Animalfeed, Kagan gave arbitrators all they needed. In the absence of a class arbitration waiver, all you need to do to have class arbitration is show that you are “arguably construing” the contract. Well, it also helps if the parties are asking you to decide whether that’s what they agreed to. Thinking he must have killed class arbitrations with Stolt-Nielsen but trapped by his own previous logic, Alito had to weigh in with an ominous and not so classy concurrence: absent class members will not be bound by this arbitrator’s decision in spite of the fact the clauses are the same because they didn’t “consent.” What does that mean? I’ve got some ideas, and it isn’t pretty. In sum, the Court finds persuasive authority to support Plaintiffs’ assertion here that the right to proceed collectively, either in a judicial forum or in arbitration, is a substantive right afforded by the FLSA. However, there are also requisite grounds for enforcing the Arbitration Agreements at issue in this case in light of the trend in the Eleventh Circuit to uphold class waivers in employment agreements and the strong presumption in favor of arbitration. Thus, while the Court itself doubts that the Arbitration Agreements are enforceable in light of the express waiver of the Plaintiffs’ right to collective action under the FLSA in any forum, in the absence of binding precedent holding that such a provision is unenforceable as a matter of law, the Court in an exercise of prudence will require that the parties proceed to arbitration pursuant to the provisions of the FAA. Unfortunately, she relied heavily on the National Labor Relation Board’s recent decision in In re D.R. Horton, Inc. which took a trouncing in December by the 5th Circuit’s ruling on the matter. Nevertheless—Classy. “The mediation apparently didn’t go well,” said Manchester, Tennessee police investigator Butch Stewart. That’s an understatement: a few weeks ago, Brenda Bartee shot her estranged husband, Dr. Harry Bartee, four times outside a Manchester law office immediately following a divorce mediation session. Dr. Bartee remains in critical condition, while Mrs. Bartee has been charged with criminal attempt to commit first-degree murder and is being held on a $1 million bond. Proponents have argued mediation in the divorce context is empowering for women as compared to litigation; however, others have countered that mediation actually disadvantages women in divorce settlements. Similar arguments can be made about firearms, we suppose, but we do not condone conflating the two concepts. The motive for the shooting in this case remains unconfirmed. Brenda Bartee claims her husband and his girlfriend had been harassing her, but Assistant Police Chief Adam Floied said Mrs. Bartee’s actions were evidently prompted by a breakdown in the mediation, at which point she left the law office to retrieve her handgun from outside. Nothing is known about the mediator’s role in all this, but one might wonder. Were there obvious indications of Ms. Bartee’s intentions during the session? If so, what responsibility did the mediator have? Could the mediator have done something to diffuse this, or did the mediator or merely the structure of the process inflame the situation? One thing, however, is clear: notwithstanding its success in the field of family law, mediation can’t resolve every dispute, but neither can a gun.